When introducing the Canon EOS R and the RF mount, Canon's first full frame lens mount introduced since the EF (electronic focusing) mount was introduced over 30 years ago, Canon also introduced some knock-out lenses and the RF 28-70mm F2 L was one of them. This is the world's first (we always love these) full frame zoom lens with a focal length longer than 35mm to have a max aperture wider than f/2.8. The RF 28-70 F2 L offers a great general purpose zoom range with an aperture a full stop (2x) wider than any alternative with a focal length longer than 1/2 as long as 70mm and that is huge. 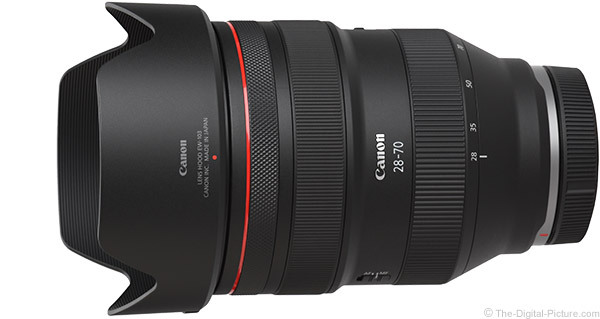 The Canon RF 28-70mm F2 L USM Lens delivers impressive image quality that is supported by fast and very accurate AF. This lens features L-series professional-grade build quality including weather sealing. Combine those qualities with a general purpose focal length range and the end result will be a most-used lens in many kits. You will need an RF-mount camera (the EOS R-series) to mount this lens on, but this lens is good enough to justify buying an RF-mount camera if only to use this lens. This is a lens that is going to sell a lot of Canon EOS R cameras and future RF-mount-compatible models. When using a prime lens, physically moving closer to or farther away from the subject (AKA, "sneaker zoom"), is typically how ideal subject framing is achieved. 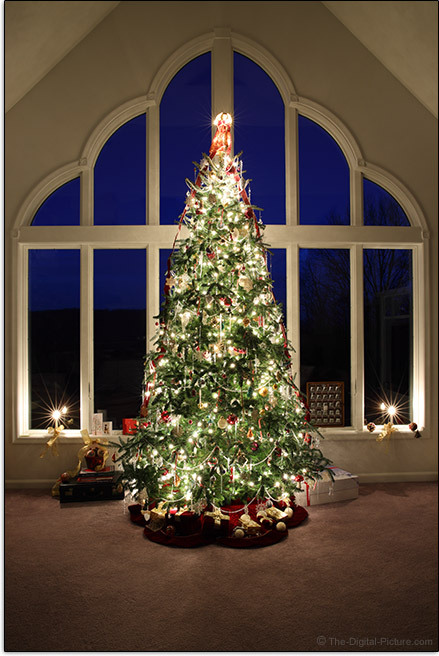 Since distance to the subject determines perspective, and focal length selection, especially for the wide and normal range, should be based on the desired perspective, the right focal length prime lens must be selected with the sneaker zoom confined to fine-tuning the framing. That can mean a lot of prime lenses are needed and a lot of time-consuming, sensor-dust-inviting lens changes required during a shoot. A zoom lens does not change the ideal perspective for a photograph, and thus, adjusting to the ideal subject distance remains important. 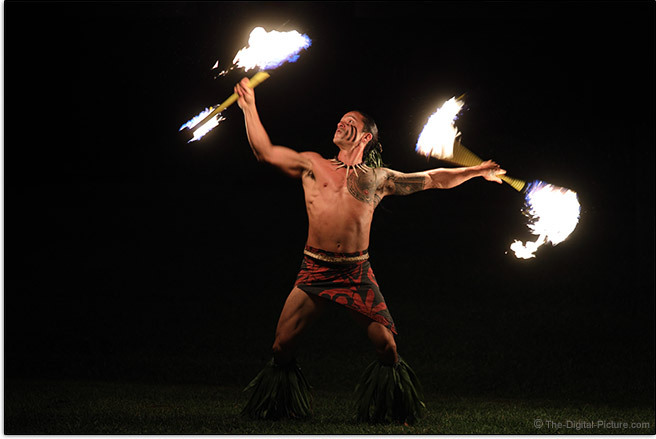 But, having a zoom lens can very dramatically speed up a shoot by eliminating most or even all lens changes. This is especially important if the subject is impatient (does that describe any of your kids? ), time is limited (weddings, for example) or the subject is not under your control (such as in most action sports). As this lens covers the core general purpose focal length range, it can save a LOT of lens changes. The 28-70mm focal length range, as alluded to by the general purpose designation, is a tremendously-useful one with an immense list of best-for subjects. This is a great focal length range for photographing people and it is ideal for portraits, weddings, parties, events, documentaries, interviews, lifestyle, theater, fashion, studio portraiture, candids and some sports. Use 70mm for head and shoulders portraits and the wider end for groups and environmental imagery. This lens is a perfect choice for media and photojournalistic needs. This lens is a good choice for landscape photography with compositions ideally captured using every focal length available in this lens. It is not difficult to create compelling landscape compositions using the 28mm perspective, while still providing emphasis on a foreground subject against an in-focus background with the viewer feeling a sense of presence in the scene. At the other end of the range, 70mm works great for mildly-compressed landscapes featuring distant subjects such as mountains. With an ultra-wide aperture, this lens is attractive for photographing the night sky. This lens is well-suited for commercial photography and is ready to capture interior and exterior architecture, cities, countrysides, flowers, medium and large products and much more. At review time, this lens is not compatible with any APS-C (1.6x FOVCF) format cameras. Should that fact change in the future, or should an R-series cameras' 1.6x crop mode be used, the full frame angle of view equivalent will be 44.8-112mm. This range is lacking from a wide angle perspective, but it has a very attractive long end, making it a great portrait focal length range. I briefly discussed prime lenses in the beginning of the focal length range discussion because this zoom lens reaches into prime lens territory. 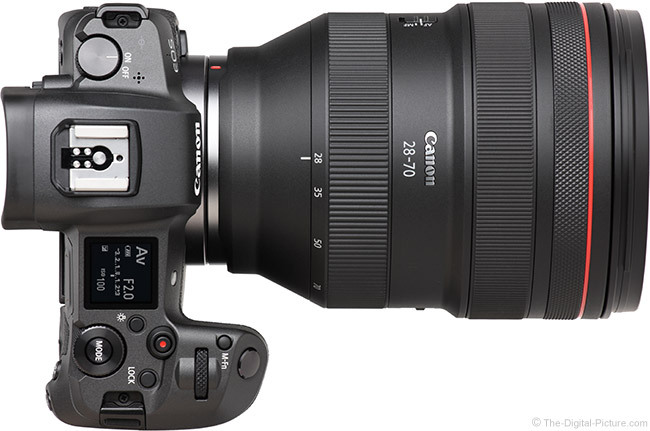 Prior to the introduction of the Canon RF 28-70mm F2 L USM Lens, only one full frame zoom lens had an aperture wider than f/2.8 and that one stopped at 35mm. Otherwise, prime lenses were required to get an aperture wider than f/2.8 in the typical/standard general purpose focal length range. While some prime lenses open a stop or more wider than the RF 28-70 F2 L, this lens opens a full stop wider than the full frame general purpose zoom lenses before it and that 2x additional light is a big deal. Wide apertures are useful for stopping action, both that of the subject and that of the camera, in low light levels while keeping ISO settings low. While having an f/2 aperture may not be greatly advantageous from ISO and shutter speed perspectives when photographing under bright light (daylight for example), the 2x difference between f/2.8 and f/2 is huge in low light scenarios. Even when photographing under bright light conditions, wide apertures are useful for creating a strong background blur that makes a subject pop from an even highly distracting background. Wide apertures are also a benefit for AF systems, enabling them to work better in low light environments. Note that this lens does not feature image stabilization. Canon's engineers have not provided a reason for this design decision, but image stabilization adds size, weight and cost to a lens. IS can also compromise image quality and durability. This lens' super-wide f/2 aperture in combination with its significant zoom focal length range make it a very attractive option. Part of the awesomeness of the Canon RF 28-70mm F2 L USM Lens is the image quality it delivers. Few spending the amount requested for this lens are going to settle for anything less than excellence in regards to image quality and this lens delivers on that expectation. This lens is quite sharp wide open at f/2 and, with a touch of increased contrast showing, extremely sharp at f/2.8. Very little improvement can be observed at 4. 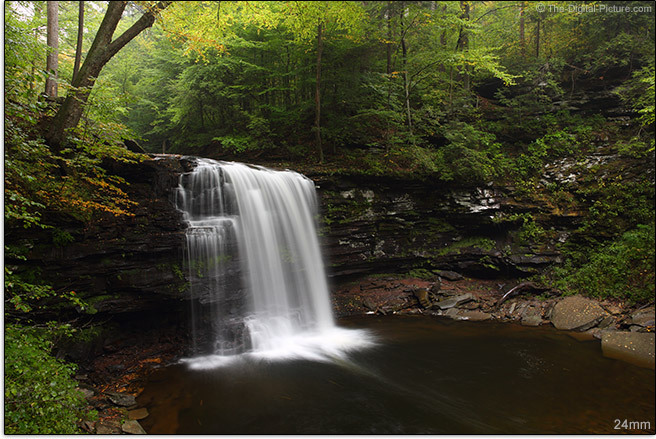 This description covers the entire focal length range and from full frame corner to corner. The focal length setting makes little difference in the image quality, an unusual quality for a lens that traverses the wide angle to short telephoto range (normal is for there to be an image quality decline at the longer focal lengths). 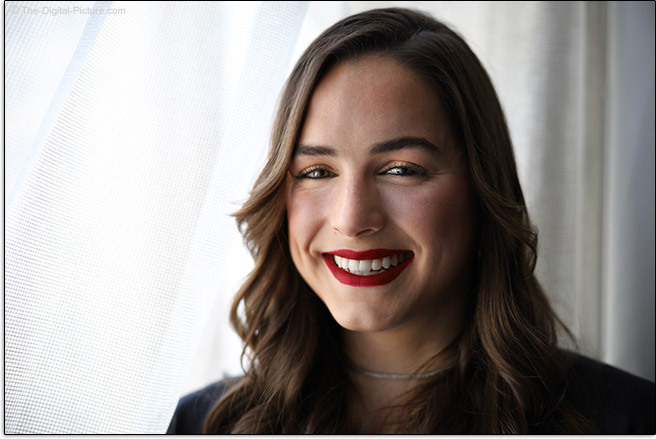 Note that the Canon EOS R's images will appear slightly softer at the same Canon Digital Photo Pro sharpness setting than the Canon EOS 5Ds R results that are shown for many of the site's lens tests. If doing direct comparisons between these two cameras, keep this fact in mind. The EOS R simply needs a +1 amount of sharpness applied to equalize the setting (try adjusting the sharpness of the sample crops provided). Here is an RF 28-70 F2 vs. RF 50mm F1.2 comparison that shows this zoom up against near perfection in a prime lens. In addition to our standard lab tests, I like to share some real world examples. The images below are 100% resolution crops from images captured in RAW format using an EOS R. The images were processed in Canon's Digital Photo Professional using the Standard Picture Style with sharpness set to "2". These examples are from the center of the frame. There could be a touch of heat waves showing in these images, but the clear sky opportunity for testing was very short and I think the results are representative of this lens' performance. The f/2 images look great (find the center of depth of field) and, with a small amount of increased sharpening, they look excellent. F/2.8 brings about that improvement naturally and these results are razor sharp. The depth of field remains well-centered as this lens is stopped down. Focus shift is not a problem. Presented below are extreme top left corners processed identically to the center-of-the-frame results shared above. Those are very impressive corners for a zoom lens and these would be impressive even for an f/2 prime. The 70mm extreme corner results are a touch softer than the other focal lengths. Do the corners need to be sharp? No, not always. For example, often when the subject is a person and a wide aperture is being used, the entire surroundings are frequently desired to be out of focus with the blur helping the subject to stand out. But, sometimes sharp corners are very important with landscape and architecture photographers among those requiring that aspect. The question is not whether or not a lens' wide open aperture images show peripheral shading, but how much shading they show. In this case, an f/2 aperture will result in about 3 stops of corner shading with just slightly less at the long half of the focal length range. Stopping down reduces the shading and f/2.8 images from this lens show from 2 to just under 1.8 stops of darkening in the corners as the focal length range is traversed. At f/4, the range is from 1.2 to 1 stop. Little additional improvement is realized with a narrower aperture selected at the wide end and only modest improvement is seen at long focal lengths save 70mm where f/8 nets about 0.6 stops. With 1 stop often used as the visibility delineator, this lens will show noticeable shading at wide apertures and still sometimes-slightly-visible shading at narrow apertures at the wider half of the focal length range. Vignetting can be corrected during post processing with increased noise in the brightened areas being the penalty. Vignetting can also be simply embraced, using the effect to draw the viewer's eye to the center of the frame. While lateral CA is usually easily corrected with software (often in the camera) by radially shifting the colors to coincide, it is of course better to not have it in the first place. Any color misalignment present can easily be seen in the site's image quality tool, but let's also look at a set of worst-case examples, 100% crops from the extreme top left corner of EOS R frames. 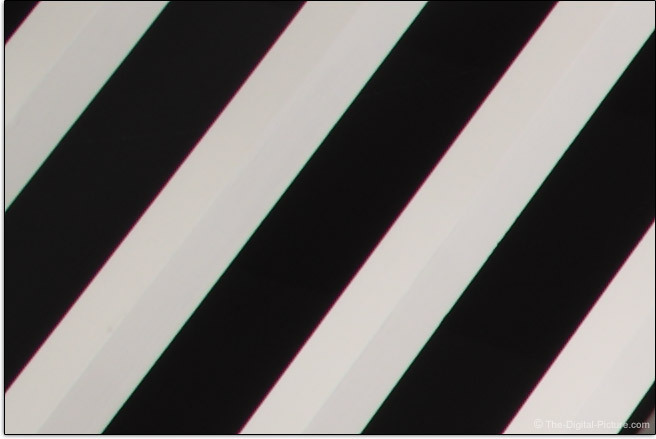 The only colors showing in these images should be black and white with the additional colors showing lateral CA. Most zoom lenses show lateral CA at their focal length extremities and this one also has some. At 28mm, the amount is modest, and by 35mm, lateral CA is essentially gone. The 50mm result is still looking great with the colors reversing and appearing in moderately-strong levels at 70mm. 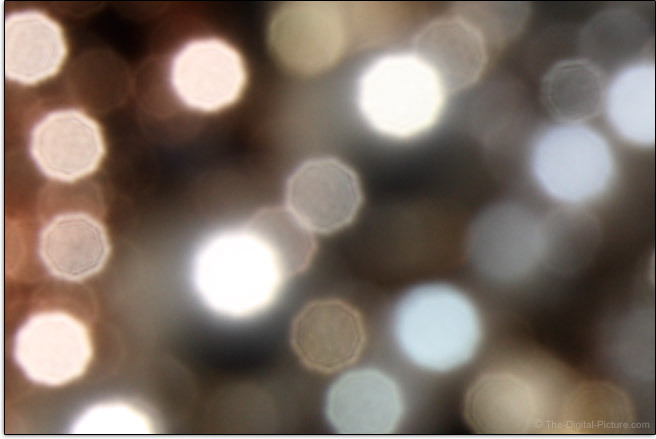 A relatively common lens aberration is axial (longitudinal, bokeh) CA, which causes non-coinciding focal planes of the various wavelengths of light, or more simply, different colors of light focused to different depths. Spherical aberration along with spherochromatism, or a change in the amount of spherical aberration with respect to color (looks quite similar to axial chromatic aberration but is hazier) are other common lens aberrations to look for. Axial CA remains at least somewhat persistent when stopping down with the color misalignment effect increasing with defocusing while the spherical aberration color halo shows little size change as the lens is defocused and stopping down one to two stops generally removes this aberration. 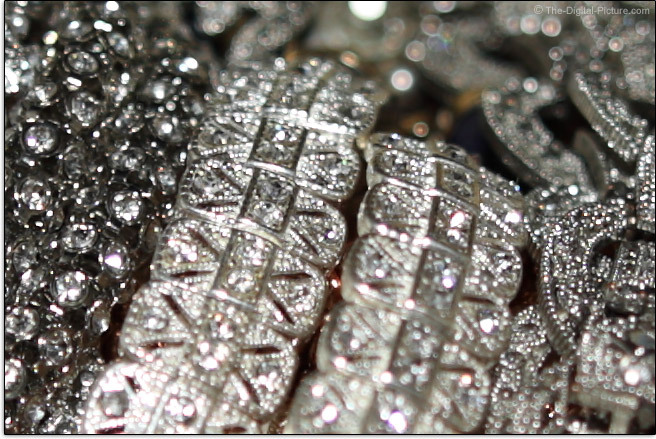 The examples below are 100% EOS R crops showing silver jewelry coming into and out of focus. These images were captured at f/2 with the second 50mm and 70mm images captured at f/2.8. A perfect lens will render the fringing foreground colors the same as the fringing background colors. While I'm not going to call this lens perfect, it performs impressively for an f/2 zoom lens, showing only minor color fringing. The RF 28-70 F2 L features Air Sphere Coating (ASC) for reduced flaring and ghosting. With 19 lenses in 13 groups in an ultra-wide aperture zoom design, flare-free is not what we expected from this lens. 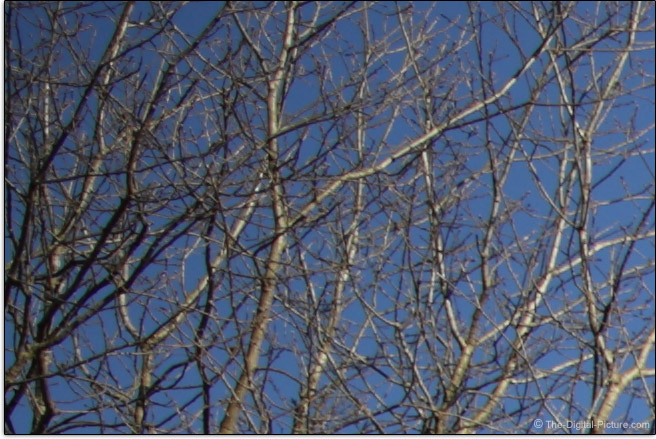 However, at wide apertures, very few flare effects are seen even with the sun in the corner of the frame. As usual, flare increases at narrower apertures and longer focal lengths. 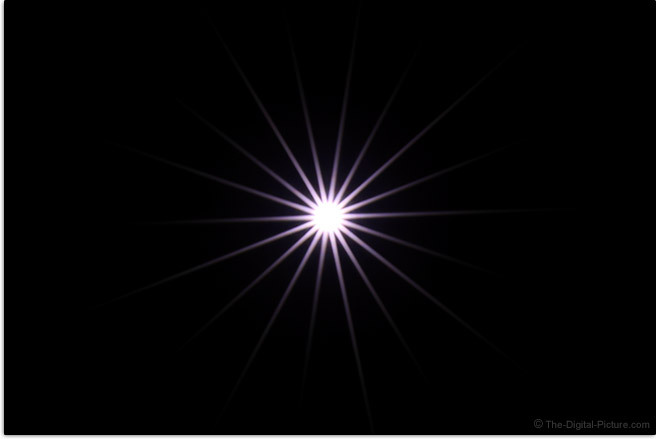 In our standard testing, a modest, but not unusual, amount of flaring is seen at 70mm f/16. Shown below are top-left 100% crops (captured on a bright-moon night). 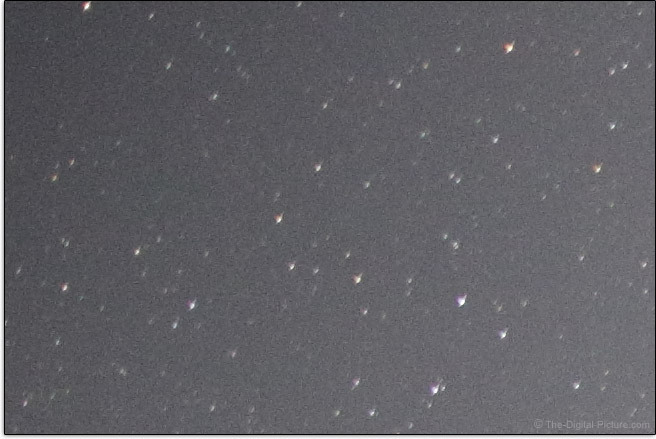 At 28mm, corner stars are being stretched outward and also show some wings in the meridional direction for average or perhaps slightly better than average performance. By virtue of the longer focal length, the stars are shown larger in the 35mm example, but the aberrations are similar. At 50mm, the stars are appearing rounder with only faint wings. At 70mm, sight inward stretching is apparent, but the results are still relatively good. Typical is for normal zoom lenses to have barrel distortion at the wide end and pincushion distortion at the long end with a transition to little or no linear distortion at a focal length closer to the wide end. This lens mostly meets that expectation. At 28mm, the barrel distortion appears as a moderate bulge most noticeable in the central portion of the image circle. The transition to no distortion occurs between 35mm and 50mm with those two focal lengths having just minor geometric distortion. I'll describe the pincushion profile at 70mm as modest. It is there, but it is not strong. Lens correction profiles are available for the popular image processing applications and distortion can be easily removed using these, but distortion correction is destructive at the pixel level and correction is not as good as using a distortion-free lens and focal length combination in the first place. 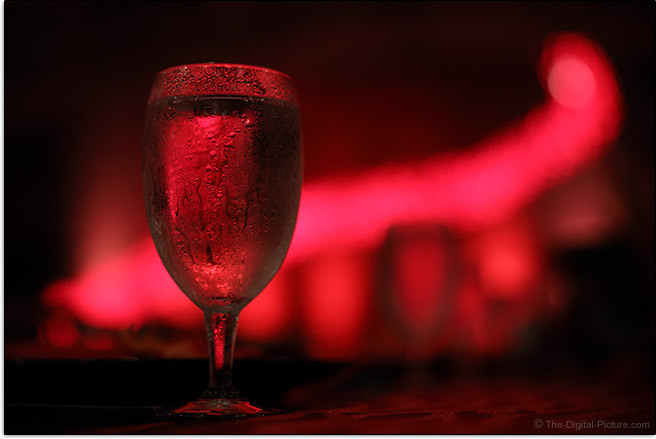 Bokeh, referring to the quality of the foreground and background blur, is a concern of many photographers. 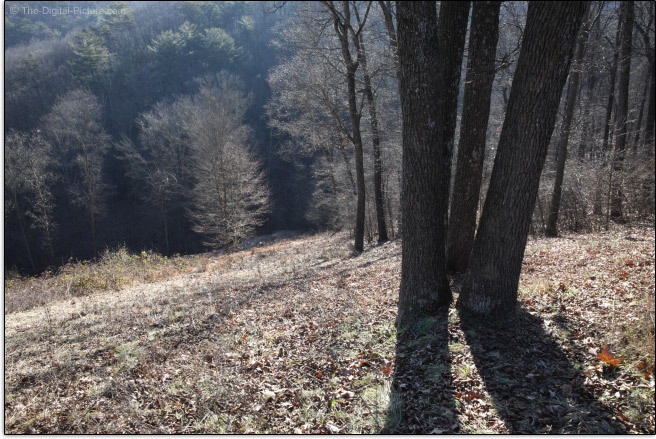 Below are some examples of out-of-focus specular highlights. While the size of the highlights change throughout the focal length range, their shape and appearance change very little. I've shared f/8 examples from both ends of the range and you can expect results from those in between to appear similar. These results are good/normal. 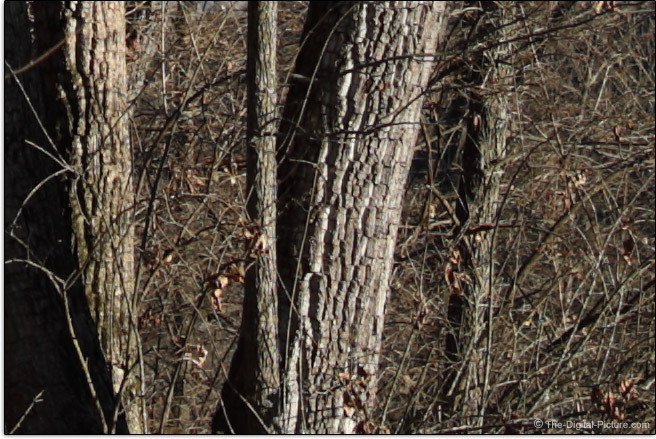 Stopped down 4 stops, the aperture blades are showing involvement, adding straight lines to the highlights' periphery. The centers show decent smoothness. The second set of examples were captured at f/2 and mild cat's eye bokeh, a form of mechanical vignetting, can be seen in the corners. Again, I've shared 28mm and 70mm examples and results from the intermediate focal lengths appear similar. Stopping down reduces the entrance pupil size and the mechanical vignetting absolves completely. This lens' 9-blade aperture produces big, beautifully-shaped 18-point stars. 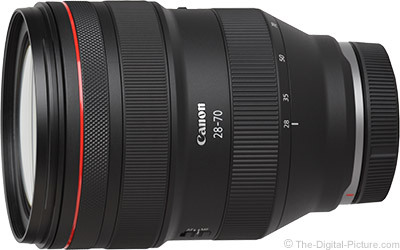 The Canon RF 28-70mm F2 L USM Lens design incorporates four aspheric lenses (correcting for aberrations, distortions and astigmatism) along with two UD elements and one Super UD element. As I've already completed the image quality discussion, we are primarily looking at the design from a "How did they do that?" perspective. Overall, the Canon RF 28-70mm F2 L USM Lens produces exceptional image quality, arguably the best standard/normal zoom lens class. 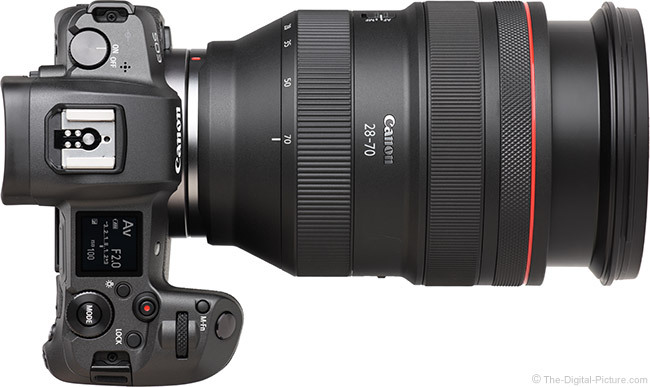 Important for any lens, but especially important for a lens destined for professional use is a high-performing AF system and the Canon RF 28-70mm F2 L USM Lens has that. The Ring USM (Ultrasonic Motor) AF system internally focuses very quickly with even long focus distance changes happening relatively fast. A quiet "shhhhh" sound of the optical group movement is heard during AF with an occassional light clunk being heard upon completion of the movement. AF distance transitions are very smooth during video recording. If AF is being relied upon, it needs to be accurate. 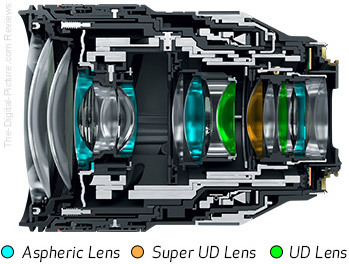 Otherwise, even the best optical performing lens is going to deliver poor image quality. AF precision is especially important for a lens with a wide aperture potentially yielding shallow depth of field. It seems that everything we mount to the EOS R focuses extremely accurately and that is the case with this lens. That this lens focuses in extremely low light scenarios is going to be very appreciated by many who opt for this lens, and that trait will surely be a significant driver for photographers selecting the lens in the first place. I can't see to walk around in light conditions that I can focus this lens in. Autofocus of course happens more slowly under these conditions, but if there is some contrast available, this lens gets the job done. At 40mm and longer focal lengths, this lens will even focus on a bright star in a medium-dark sky location with a bright moon. The focus ring is mid-sized and positioned in front of the zoom ring (this is my strongly-preferred position). 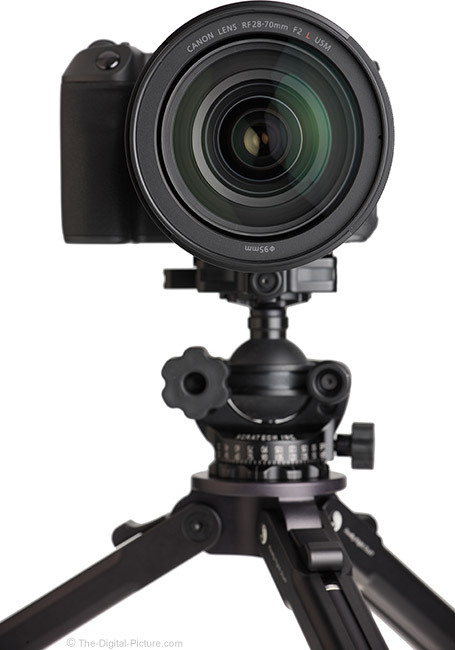 With a diameter increase occurring just behind it, the focus ring is easy to tactilely locate. This is a focus-by-wire or electrical manual focus system (vs. a direct gear-driven system). The manual focus ring is a switch that electronically controls the focus of the lens as it is rotated. FTM (Full Time Manual) focusing is supported in AF mode with the camera in One Shot Drive Mode, but the shutter release must be half-pressed for the focus ring to become active. Note that FTM does not work if electronic manual focusing is disabled in the camera's menu. The lens' switch must be in the "MF" position and the camera meter must be on/awake for conventional manual focusing to be available. With electronics driving AF, the rate of focus change caused by the focus ring can be electronically controlled and it can be variable, based on the ring's rotation speed. I frequently find the implementation of that feature to not be favorable and with the R-series cameras, a linear adjustment speed can be configured. While that setting is often my preference, this lens' variable focus adjustment feature is dialed in very well with the rate required for the faster speed is set high enough that I do not inadvertently reach it and the variable speed setting is what I have been using for this lens. In the linear adjustment rate mode, about 180° of ring rotation is required to adjust from MFD to infinity. In the variable rate mode, between roughly 50° (a quick turn of the focus ring) and 360° is the rotation range for the full extent adjustment. The manual focus ring has an ideal resistance and adjustments are smooth with no play and no unusual framing shift happening. This lens maintains (naturally or, more likely, electronically) the proper focus distance throughout the entire zoom range (parfocal). Change the focal length after focusing and it appears to remain properly set, a nice feature, especially for video recording. Note that this lens' aperture changes are quiet and smooth, another sought-after feature for video recording. No focus distance scale is provided on the lens, but a digital scale can be enabled in the electronic viewfinder or LCD. The RF 28-70's focus ring is not big in width but it is large enough to be quite useful. The RF 28-70 F2 L has a 15.4" (390mm) minimum focus distance (MFD) that delivers a 0.18x maximum magnification (MM) at 70mm. These are not remarkable specs, but they are decent. While this is a zoom lens and most zoom lenses have stronger magnification capabilities, this lens has prime-like max apertures and it bests the max magnification of many of the longer focal length prime lenses included in the table below. A subject measuring about 7.3 x 4.9" (185 x 123mm) can be made to fill the viewfinder at 70mm. 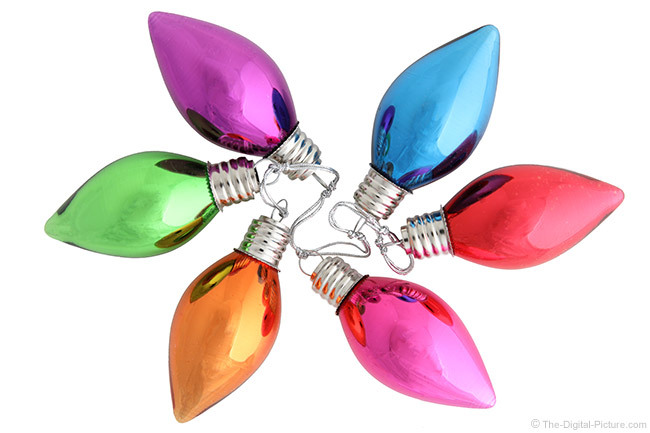 The 2.5" (634mm) bulbs in the image below were captured at this lens' minimum focus distance. Magnification from wide angle through standard/normal focal length lenses is generally significantly increased with the use of extension tubes, hollow tubes with electronic connections that shift a lens farther from the camera. As of review time, RF mount-compatible extension tubes do not exist. While Canon's RF L lenses take on a slightly updated look, those familiar with EF L lenses will immediately recognize this lens' heritage, primarily denoted by the red ring. The L designation assures that this lens has professional grade build quality and reliability required by those who must bring home the assigned imagery. 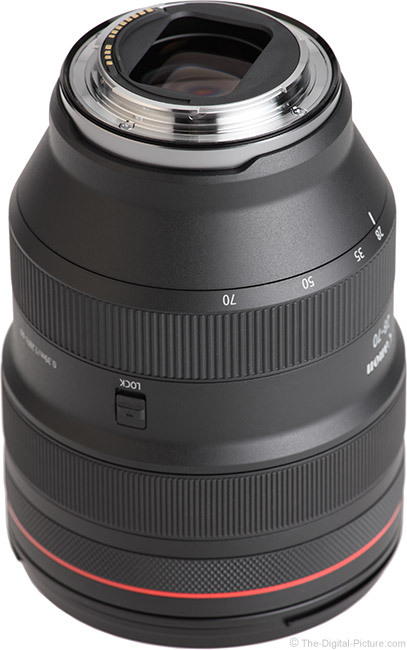 This lens has great looks and the fit and finish are excellent. 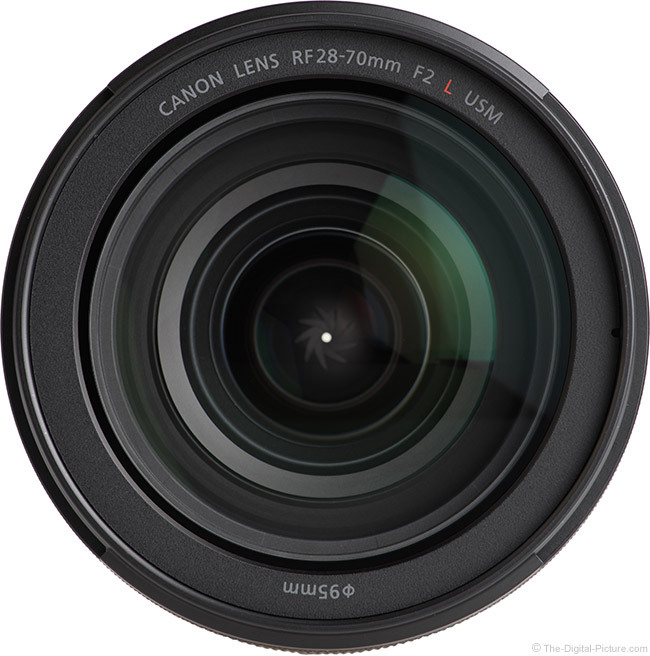 While it is not especially long, the Canon RF 28-70mm F2 L is a handful of a lens because of its wide diameter. The mount is of course the standard size for an RF lens (relatively large and easy to work with) and there is adequate space available to grip the camera without the grip hand's knuckles touching the lens as its diameter continues to linearly increase until straightening at a large diameter within the zoom ring. Being part of the front edge of the first straight portion of the barrel makes this ring easy to find and convenient to use. The zoom ring is smooth with no play. A small diameter increase occurs just prior to the focus ring. Keeping the focus ring just past this diameter increase, versus being part of it like the zoom ring, makes it harder to inadvertently change focus while making the ring still easy to tactilely find, as discussed earlier. New with Canon RF lenses is the knurled "Control Ring", able to be configured for fast access to settings including aperture, ISO, and exposure compensation. Note that the control ring is clicked by default and this ring's clicks are going to be audible in camera-based audio recordings. Canon offers a de-click service for this ring (at a cost). This lens features a quality plastic external construction. As illustrated above and in some of the other product images in this review, this lens extends modestly (0.87" / 22.2mm) when zoomed to 70mm. The extended inner lens barrel has a very slight amount of play. A switch is provided to lock the lens at the retracted 28mm length, preventing gravity extension that wasn't a problem on the review lens. The AF/MF switch is flush-mounted with just enough raised surface area available for easy use, even with gloves. The location of the switch is standard for Canon lenses and accessing it seems natural. This is a weather-sealed lens, but don't confuse this feature with waterproofness. Still, weather sealing can sometimes save the day, even indoors. Like most other recent L lenses, the RF 28-70 F2 L features fluorine coatings on the front and rear lens elements to avoid dust adhesion and to make cleaning easier. This is one of those features that goes unnoticed until something happens in the field. We discussed the wide diameter of this lens and that is a primary trait. The reason this lens is wide is to avail the wide aperture and the large diameter lens elements required by it. Large lens elements are of course heavy and with a relatively large number of these packed inside, this lens is rather heavy. While you are going to know that you have been holding this lens several hours into a shoot (and might want to opt for another lens for a backpacking adventure), the RF 28-70 F2 L has a great solid feel. In the table below, the RF 28-70 F2 L is positioned between a set of zoom lenses and a set of primes lenses, both of which it competes against. 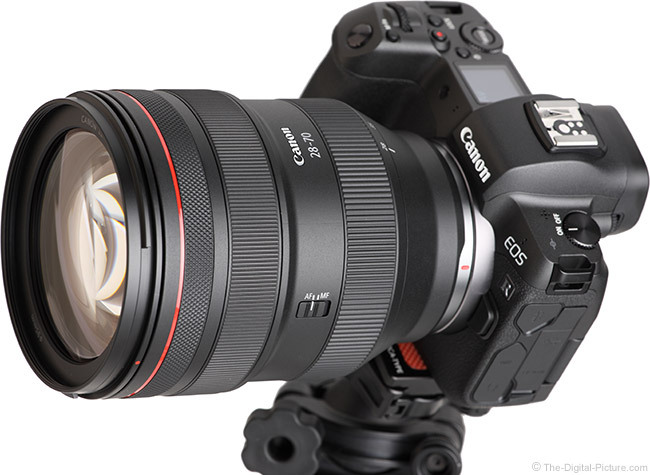 For many more comparisons, review the complete Canon RF 28-70mm F2 L USM Lens Specifications using the site's Lens Spec tool. With no tripod mount ring included, tripod mounting a camera with this lens attached means cantilevering a significant amount of weight forward of the attachment point. 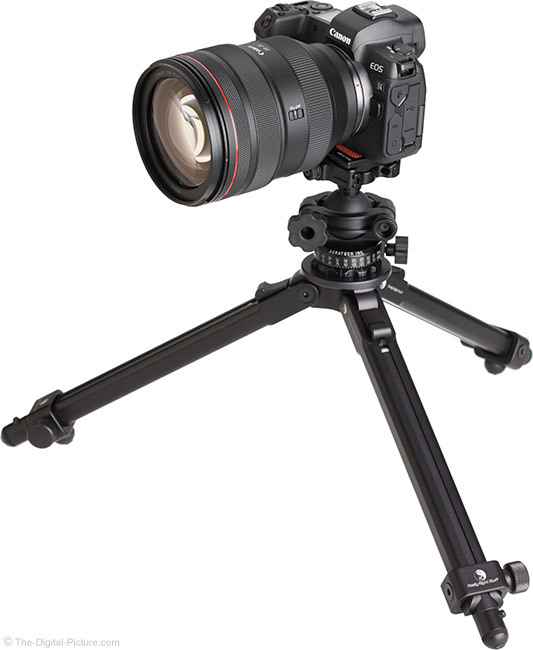 A strong tripod head is needed to avoid a significant downward movement upon locking the head tight. Also, this much weight unbalanced can twist a tripod head lose if it is not tightly locked in place. The size of this lens partially blocks the EOS R focus assist light, creating a large circular shadow covering bottom left corner of the frame, extending just past the center AF point without the hood attached. The shadow is slightly increased with the hood in place. Selecting an AF point outside of this blocked light area will be necessary in extremely low light scenarios. Also note that this lens extends below the bottom of the EOS R (without a grip) enough to potentially cause issues with accessories mounted under the camera. To avoid impact, the lens must be lowered into the Oben BC-139 Ball Head clamp while turning the lock knob closed. The Really Right Stuff Lever-Release Clamps clears the bottom of the lens when opened, but not by much. Putting the sizes into visual perspective is usually advantageous. 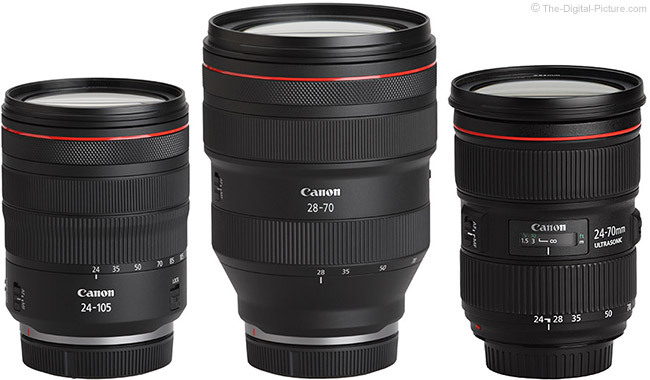 Use the site's product image comparison tool to visually compare the Canon RF 28-70mm F2 L USM Lens to other lenses (another comparison is preloaded). A wide diameter lens will usually require a wide diameter filter. This one's threads are 95mm wide and that means the filters are large and the quality models you want are expensive. We don't have a standard thickness 95mm circular polarizer filter to test for increased peripheral shading with, but a slim model such as the B+W XS-Pro or Breakthrough X4 is my recommendation. L-series lenses ship with a lens hood and this one comes with a Canon EW-103. This hood model features a spring-loaded release button that makes installing and removing the hood effortless. The hood is made of semi-flexible plastic that should absorb some impact and, overall, provide reasonable physical protection. Protection from light is going to be about as good as possible at the wide angles with the made-for-28mm design being smaller than a designed-for-70mm hood would be. The EW-103 has a molded rib interior designed to avoid reflections and a matte finish exterior to ... look good. The widest inside measurement of the bayonet mount measures 103mm, matching the name and, as expected, this is a wide hood. My medium-large hand can just adequately press the release button while grasping around the side of the hood. Smaller hands may need to grasp the hood from the front where the reach is shorter. 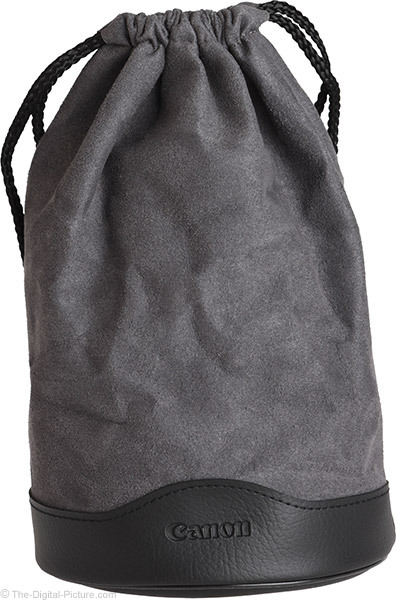 As is customary for Canon standard zoom lenses, a soft-side drawstring pouch is included in the box. The model arriving with this lens is the LP1424. This pouch offers protective padding on the bottom, but the sides offer lighter protection, primarily from scratches and dust. 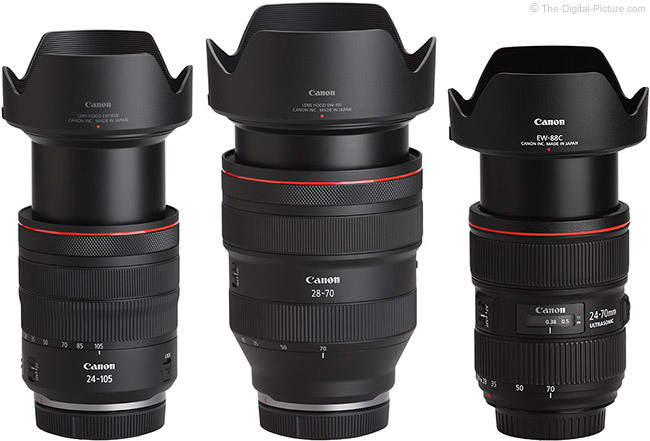 Take note of the dimensions of this lens when considering which case(s) you plan to carry it in. 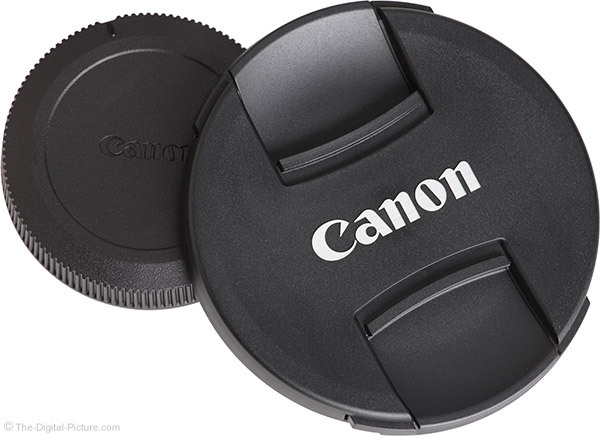 The Canon E-95 95mm Lens Cap is of course huge, but it works very nicely. As indicated in the first paragraph of this review, the RF 28-70mm F2 L carries a high price tag. While the attributes of this lens are very enticing to most photographers, only those with high budgets are going to be able to afford this one. 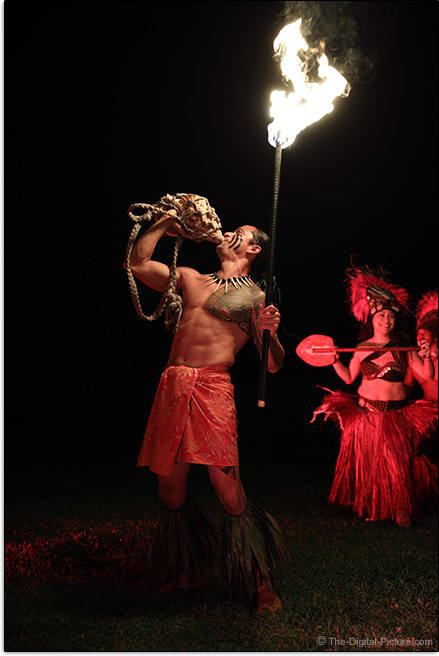 Professionals covering important events such as weddings will definitely find this lens to be of great value. For those that cannot afford the lens, its value is a moot point. However, for those, renting is a great option. 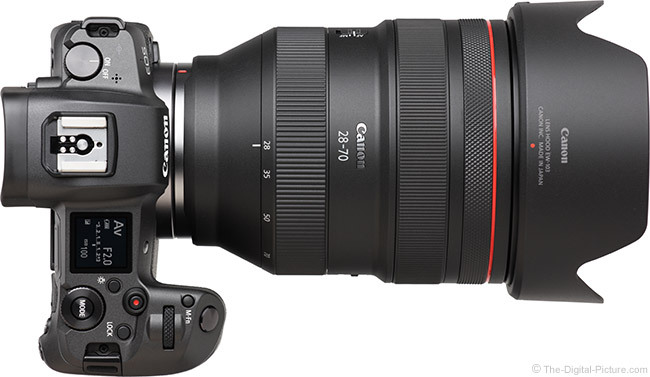 As an "RF" lens, the Canon RF 28-70mm F2 L USM Lens is compatible with all Canon EOS R series cameras. Canon USA provides a 1-year limited warranty. 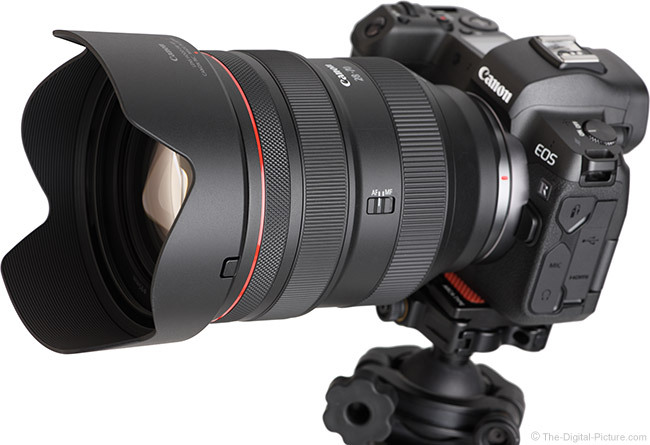 The two Canon RF 28-70mm F2 L USM Lenses used for this review were on loan from Canon USA. To put it succinctly, this lens has no equivalent alternative and choosing a different lens means sacrificing something. Basically, you can have the focal length range or you can have the wide max aperture. Only this lens gives you both. At review time, most will consider the Canon EF 24-70mm f/2.8L II USM Lens to be the primary alternative. This lens covers the entire focal length range plus an extra 4mm on the wide end with a max aperture that, prior to the RF 28-70mm F2 L introduction, was the widest available in a standard zoom lens. The 24-70 II has impressive image quality and many of us were anxiously awaiting the RF 28-70mm F2 L vs. EF 24-70mm f/2.8L II Lens image quality comparison. When viewing this comparison and any of the others below, keep in mind that the EOS R images are slightly less sharp at the same sharpness setting. I'm not saying the EOS R images are not as sharp, just that a +1 sharpness setting is needed to bring them to about equivalency. The test camera resolution also plays favor to the non-RF lenses. Back to the image quality comparison ... at f/2 vs. f/2.8, the RF lens is not quite as sharp in the center at the wide end, but is somewhat sharper in the periphery at the long end. Compare both lenses at f/2.8 and the RF lens has a stronger advantage at the long end and they are arguably about the same at the wide end. The EF lens has slightly stronger barrel distortion at 24mm than the RF lens has at 28mm, but the advantage reverses at the equivalent 28mm setting and reverses again at 35mm with the RF regaining the advantage. The RF lens holds a slight distortion advantage through 70mm. At f/2, the RF lens has modestly stronger peripheral shading than the EF lens does at f/2.8, but in the direct f/2.8 comparison, the RF lens has the modest advantage. The two lenses are more similar in this regard at 35mm, but the RF lens retains an advantage, especially deep in the corners at longer focal lengths. The RF lens shows a bit less flare in our tests. 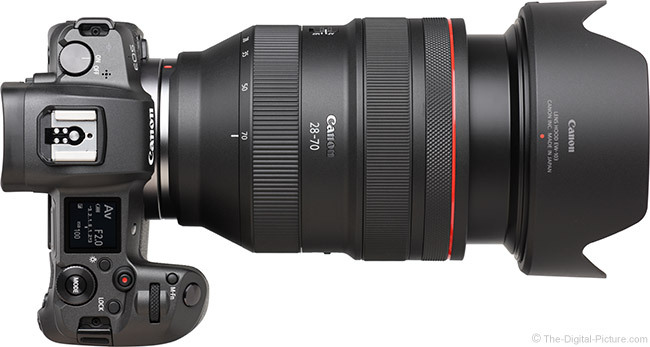 Looking at the specs and measurements, the Canon RF 28-70mm F2 L vs. Canon EF 24-70mm f/2.8L II USM Lens comparison shows the RF F2 Lens being considerably larger, especially in diameter. No surprises there. It weighs considerably more also. 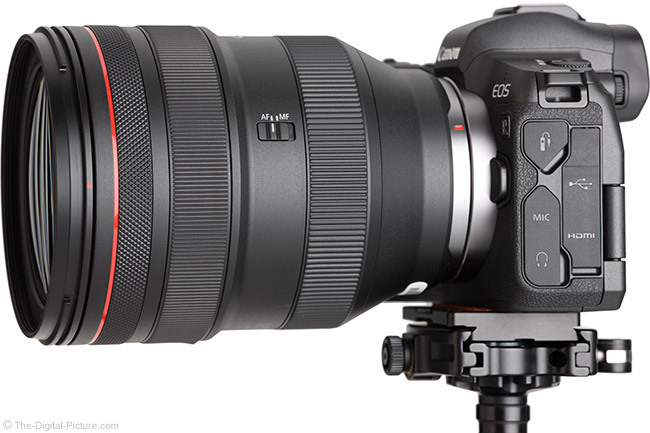 While both lenses utilize Ring USM-driven AF, the RF lens uses electronic manual focusing. The EF lens holds a small maximum magnification advantage (0.21x vs. 0.18x) and has extension tubes available for it. The EF lens uses large 82mm filters, but the RF's 95mm filters are considerably larger still. That, at review time and without any promotions factored in, the EF lens costs 2/3 as much as the RF lens even with the required Canon Mount Adapter EF-EOS R factored in will be a deciding factor for some. I'll let you choose the winner in that comparison as both lenses are best for certain budgets, applications and use scenarios. If you don't need the f/2 aperture, you might find the EF 24-70mm f/2.8L II the better purchase. There are also a huge number of prime lenses that could be compared here, but I'll select one, the Canon RF 50mm F1.2 L USM Lens. This lens is an RF model, was introduced simultaneously with the RF 28-70 and is of a similar quality level. Obvious differences to get out of the way are the 28-70's zoom range versatility and the 50 F1.2 L's 1 1/3 stop aperture advantage that includes better low light performance and a stronger background blur capability at 50mm. Both advantages are big and which is more important depends on the application. In the image quality comparison at f/2, the 50mm lens with stellar f/1.2 image quality, is stopped down 1 1/3 stop and takes this comparison. That should surprise few. But, how small the difference is just might be found surprising. The gap at f/2.8 is very small. The 50 has less linear distortion than the 28-70 at 50mm. The 28-70 has slightly less peripheral shading at medium and narrow apertures. Looking at the specs and measurements, the Canon RF 28-70mm F2 L vs. RF 50mm F1.2 L USM Lens comparison shows the 28-70 being considerably larger and heavier. The 28-70's 95mm filters dwarf the 50's still-large 77mm filters. The 50 gets an extra aperture blade (10 vs. 9) and a focus range limiter. The price of the 28-70 is considerably higher than the 50. 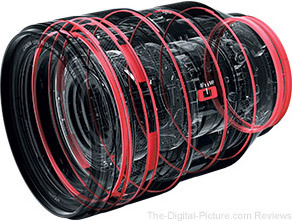 There are many other lenses that could be compared to this one. Use the site's tools to make your own comparisons. 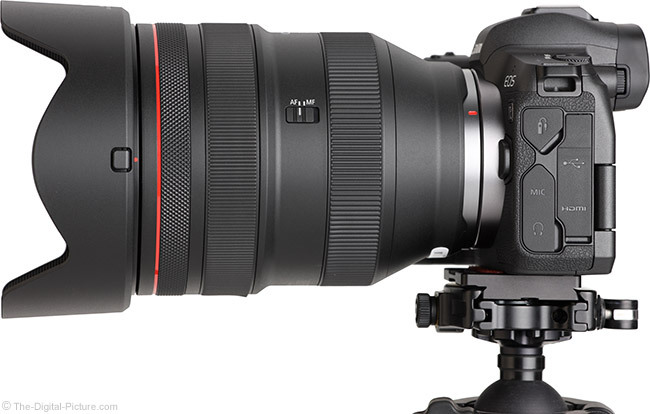 The Canon RF 28-70mm F2 L USM Lens is a large, heavy and expensive lens that is also awesome. Garnering a world's first on its credit list, this lens brings the f/2 aperture to the extremely useful standard zoom lens. With the RF 28-70mm F2 L Lens in your hand, it is like having a large kit of prime lenses always mounted on the camera. That this single lens may be able to replace a kit of alternative prime lenses makes those three downsides much more tolerable. The image quality provided by this professional-grade, all-around-high-performing lens significantly lessens any pains remaining. With price being a barrier to entry, those affording this lens will be able to differentiate their capabilities from those that cannot, creating a desirable separation for photographers who rely on their imagery to earn an income.